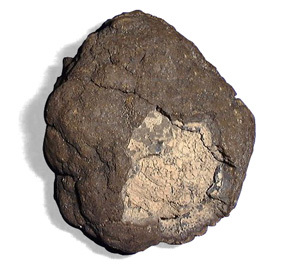 Manganese is a naturally occurring mineral that is present in soils, rocks, and sediment. It is a beneficial mineral found abundantly in many common grains and vegetables. It is essential to human nutrition, but in water it is generally regarded as unhealthy for humans in concentrations of as little as 0.5 parts per million. In deep water wells, manganese can be found in concentrations as high as 2 to 3 parts per million, although amounts are usually smaller. As little as 0.05 parts per million (ppm) can cause black and brown staining. Manganese often exists with iron, and the two together often make chocolate-colored brown stains. In general, manganese is difficult to remove from water because removal depends on its state of oxidation, the pH of the water, the presence of other minerals, and the TDS (total dissolved solids) of the water being treated. Another complication is that manganese often appears along with iron and hydrogen sulfide. Evidence of manganese is often first seen in dishwashers because detergents raise the pH of the water high enough (>8) to allow manganese to precipitate (come out of solution and take on a solid, visible form). Another place to look for manganese is in toilet tanks, where it often appears as a floating film on the surface of the water. Shining a flashlight on the surface of the water makes the manganese film more obvious. Like iron, manganese in water takes on two forms. After precipitation, manganous manganese becomes a solid and no longer remains in solution. It can turn water black. This form is called manganic manganese. Precipitated manganese is easily removed by a filter, but it is not removed well by a water softener. It is important to understand that a water softener is an ion exchanger. It deals with un-precipitated ions. Filters can't remove manganese or iron in their un-precipitated state. Softeners can serve as filters for precipitated manganese, but they are poor filters at best. The water treatment for manganese is similar to that for iron although there are some important differences, mainly involving pH. Removing manganese with a filter requires a higher pH than iron. Removing manganese with a filter is often easier if iron is present. If conditions are right, a water softener is the best tool for removing manganese. The softener can handle significant quantities of manganese, but it only works well if all the manganese is un-precipitated and remains un-precipitated. Precipitated manganese is not only poorly removed by the softener, but it is especially harmful to the softener resin. TDS: Softeners remove manganese best if the total dissolved solids (TDS) of the water is low. When TDS is high, other minerals in the water compete with the manganese for space on the resin and can even displace manganese which has attached to the resin. Water with <500 ppm TDS works best for manganese removal by a water softener. pH: There are mixed recommendations from experts on this topic, but logically pH needs to be lower than 8 if a softener is to remove manganese as an ion. The pH must be low to prevent precipitation which occurs at higher pH levels. This is also contrary to what is needed for manganese removal with a filter. As is also true with iron, when treating manganese with a water softener it is best to use a high salt dosage and keep service run short to avoid mineral build-up on the resin. Frequent regeneration is important. To remove manganese from water with a filter, a high pH reading and a sufficient oxygen content are necessary to ensure precipitation. Although different filter media have different requirements, in most cases a pH greater than 8 is need for effective manganese removal. In most cases, an oxidizer like chlorine, air, ozone, or potassium permanganate is used as a pretreatment to filtration. Amendment of pH is also often needed. Removal of manganese with a filter can vary from very simple, with any good granular medium, to a much more complicated two or three step process which requires adding an oxidizer and a pH amendment step. Manganic manganese can be easily removed by a simple filter. If the amount is very small, a cartridge-style sediment filter will serve. If a significant amount of manganese is involved, a backwashing filter containing multi-media (sand, garnet, anthracite, for example), Filter Ag, Zeolite, Micro Z, or any good sediment reduction medium can be used. In cases where un-precipitated manganese is present in a relatively low concentration and the oxygen content and the pH of the water are reasonably high, manganese can be handily removed with filter media that serve as catalysts to change the manganese to its precipitated form. Media such as Birm, Filox, and Catalox will cause the manganese to convert to its physical form then filter out the precipitated manganese in the same operation. Backwashing the filter then rinses away the trapped contaminant and restores the filter bed. Filters of this type are very effective if conditions are right, and they seem to work best if there is more iron in the water than manganese. Catalytic media filters can also be used after pretreatment with an oxidizer, as described below. Pretreatment usually means a free-standing oxidizer, but it can also include pH enhancement. Pretreatment with air can be done in a number of ways. The oldest is with a “venturi” setup that is installed before the well's pressure tank to draw air into the water line. The venturi is usually followed by a small vent tank that gives the air time to oxidize the manganese and to get rid of excess air. The water then goes to the filter, where the manganese is removed. A more aggressive and more effective system uses a larger treatment tank into which air is fed from a small air compressor. Air is compressed into the top third of the tank and oxidation occurs quickly as the water being treated falls through the pocket of compressed air. The filter follows the aeration tank. A variation on the compressed air system does the aeration in the filter tank itself, using, again, the top third of the tank and relying on an air draw feature supplied by the filter's control valve rather than a compressor. Closed Tank Aeration System that is fed by a small compressor. The top third of the tank holds a pocket of compressed air. Air is a powerful and reasonably rapid oxidizer. Aeration, of course, assures that the dissolved oxygen required for manganese removal is present, but pH is still a concern. A calcite tank can be added before the filter, but with the high pH requirement of manganese, soda ash or caustic soda injection usually works better. When the water is properly pretreated with air and a pH enhancer, any good filter medium will remove manganese. Best results are gained, however, by using a top grade iron medium like Filox. Chlorine is a strong oxidizer, but it requires more “residence time” than air. Chlorination can be done via a pellet dropper (dry pellet chlorinator), which drops calcium hypochlorite pellets into the well itself, or with a feed pump which inject liquid chlorine under pressure into the water line. If the pump is used, a retention tank must be added to give chlorine time to do its work. At least 20 minutes residence time is usually recommended. As with aeration, the chlorination step must be followed by an iron filter. The choice again is wide, but one of the standard filters that works well independently or following aeration, Birm, cannot be used with chlorine. Carbon works well if the amount of manganese is small, and catalytic carbon works better than standard carbon. Carbon has the advantage of removing the chlorine along with the manganese. When chlorine is fed by a pump, a pH increaser like soda ash can be injected along with the chlorine. Potassium permanganate, a strong oxidizer, is used almost exclusively with filters using greensand as a medium. It is usually drawn into the filter during its regeneration stage. Greensand filters are effective removers of manganese, iron, and odors, but they are generally more difficult to maintain and are, therefore, not a favorite with owners of residential wells. Ozone and hydrogen peroxide are also powerful oxidizers of manganese, but since they are seldom used in residential treatment, they aren't being considered here. Filox Filters (for iron, manganese, and hydrogen sulfide reduction).